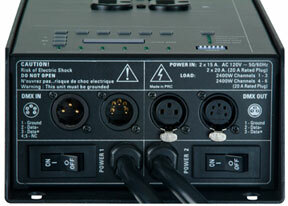 Elation DP-640B 6 Channel Hybrid Pack DJParts - All Variety of Parts that DJ Needs. • 6 channel hybrid pack with dual 20A Edison sockets per channel. • Each channel can be assigned to Dim or Switch modes. • 4 function LEDs for DMX Address, Patch Address, Local Control, and Dim/Switch modes. • On board Local Control allows for dim intensity adjustment, from 0-100%, for each channel. • Dual 20A/AC120V Power line cords.